DETROIT -- Building on the success of its A3 Sportback, Audi will give the upsized body style to two future models. One is a five-door version of the A5, which could arrive as soon as this autumn. The other is the Sportback concept that debuted Sunday at the Detroit auto show. 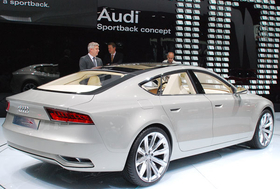 The car previews the top-range A7, which is set to enter production in 2010. Following the lead of Mercedes-Benz's CLS class and Audi sister brand Volkswagens Passat CC, the five-door Sportback concept has a coupe-like roofline. While unveiling the Sportback concept, Audi CEO Rupert Stadler said Audi would also extend the Sportback body style to the A5 range this year. The A5 Sportback, basically a five-door variant to the A5 coupe, will most likely debut in the second half of 2009. Currently offered as a coupe only, the A5 also will add a softtop cabriolet, which is expected to debut at the Geneva auto show in March. The next two years will be crucial in the Audi range expansion. Next year, Audi will launch a new generation of the A8 upper-premium car and debut the A7. For entry-level buyers, Audi will begin sales of its new entry-premium model, the VW Polo-based A1, in 2010. -- Jonathan Wong contributed to this story.